News stories in the “Age of Trump” are part Shakespearian play, part “Game of Thrones,” backed up by millions of treacherous tweets. That’s the light-hearted side of a far more serious endeavor that New York Times journalists Maureen Dowd and Carl Hulse have wrestled with for the past two years as they’ve tried to explain the actions of U.S. politicians to an often-confused public. 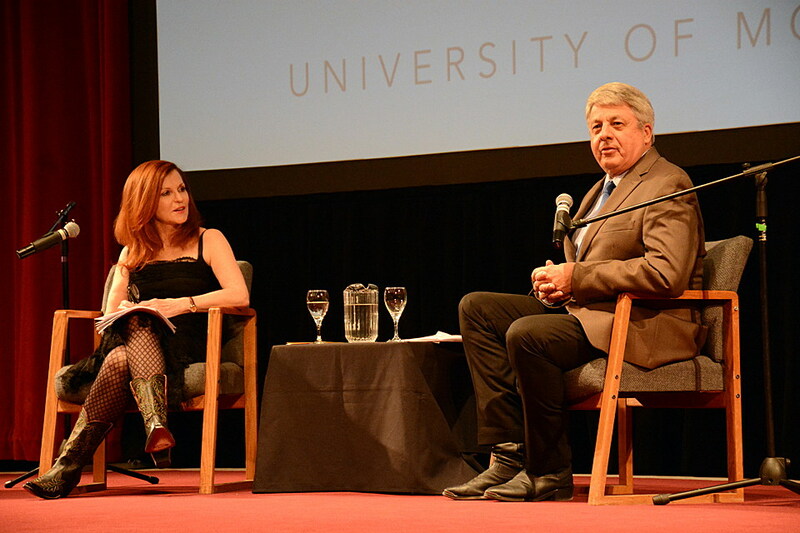 On Wednesday night, they offered insights and opinions to a packed Dennison Theater at the University of Montana as the first lecture in the new Baucus Institute Speaker Series. Dowd is a Times op-ed columnist and Hulse is the newspaper’s Washington correspondent. Both have covered political news for about 30 years. They’ve often worked on assignments together, and compared notes after meetings with government leaders. So they know the Trump administration is not business as usual. “I read one tweet that said Trump has made the GOP the party that doesn’t like the NFL and the FBI and does like the Russians and black rappers. How did that happen?” Dowd said. Hulse warned that, in spite of Trump’s bombastic comments and erratic decisions, the Democrats could lose in 2020 if they don’t have good solutions and a compelling candidate. All politics is temporary, Hulse said. The one thing that’s different now, Dowd said, is Russian president Vladimir Putin’s influence on the Republicans. For Trump’s play: “Russian president despises nasty woman, decides to elect his buddy,” Dowd said. Even so, the two reporters also said that Trump has given the press a lot to write about. 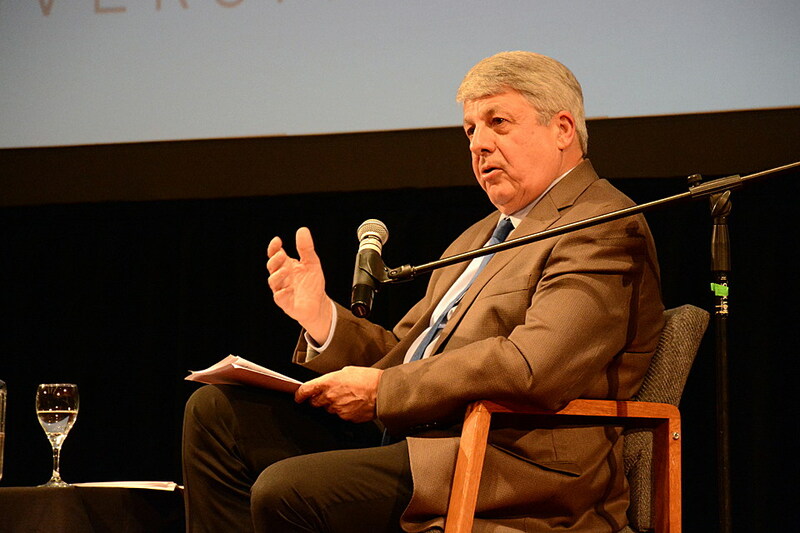 As the two journalists went back and forth, asking each other questions throughout the lecture, they ranged from the 2016 campaign and the Democrats’ mistakes to Justice Brett Kavanaugh and the U.S. Supreme Court. Often, they would initially respond with a witty comeback but then touch on more weighty aspects. Hulse said the Supreme Court nomination process probably hurt the court, the Senate and a few senators. This is now the most partisan court ever, Hulse said. Where once a more centrist conservative would make a crossover vote on some cases, now the court will probably be locked into party line votes on certain issues. Hulse said that could reduce the public’s respect for the law. In the Senate, chairman Mitch McConnell is downplaying the effect of pushing the Kavanaugh vote through after thwarting the nomination of Obama’s nominee, Merrick Garland, for 239 days. But Hulse said the process wrecked the reputation of the Senate and is likely to have long-term repercussions. However, Hulse and Dowd expressed sympathy for how the nomination process affected three Republican senators in particular. Alaska Sen. Lisa Murkowski stood up to Trump as the only Republican no vote, and now Trump has said she won’t live it down. South Carolina Sen. Lindsey Graham was expected to follow in the footsteps of John McCain as a swing vote, but Hulse said the grieving Graham has lost his way after McCain’s death. Finally, Maine Sen. Susan Collins, a moderate, has become the target of women and liberals for her vote confirming Kavanaugh, but Hulse said her critics aren’t being fair. Dowd explained that most of her family is fairly conservative, especially her brother Kevin, who turns out to have been one of Kavanaugh’s basketball coaches at Georgetown Prep. Recently, during what was to be a brother-sister getaway to Monument Valley, they ended up watching Kavanaugh’s confirmation and swearing-in. Dowd said she was surprised when Kavanaugh thanked his coaches, and Kevin, who rarely cries, started doing just that. “I think we’re at a point in the country where it’s almost impossible for each side to look at things from the other side’s point of view. I have to do that because this is my family and I love them,” Dowd said. Both journalists agreed that Twitter is a curse, mainly because it encourages a lack of civility. A president who uses tweets to make policy on the fly and a new algorithm that prioritizes brawls among users have only worsened that. Hulse said it’s like an accelerant being thrown on the fires of controversy.